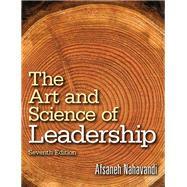 Nahavandi’s text has an application emphasis with a cross cultural perspective on leadership. Encourage Students to Apply Theory to Their Own Development: Strong theoretical coverage and cutting-edge research is presented. Afsaneh Nahavandi is professor and department chair of Leadership Studies at the University of San Diego and professor Emeritus at Arizona State University. She earned a Bachelor of Arts degree in Psychology and French from the University of Denver and holds an MA and PhD in Social Psychology from University of Utah. Her areas of specialty are leadership, culture, ethics, and teams. She has published articles and contributed chapters on these topics in journals such as the Academy of Management Review, the Journal of Management Studies, the Academy of Management Executive, and the Journal of Business Ethics. Her article about teams won the Academy of Management Executive’s 1994 Best Article of the Year award. Her other books include: Organizational Behavior (with Robert Denhardt, Janet Denhardt, and Maria Aristigueta, 2014), Ancient Leadership Wisdom (2012), Organizational Behavior: The Person–Organization Fit (with Ali Malekzadeh, 1999), and Organizational Culture in the Management of Mergers (with Ali Malekzadeh,1993). She joined the department of Leadership Studies at the University of San Diego in 2013 after teaching at Arizona State University for twenty six years in both the Business School and in the School of Public Affairs. She also taught in the Business School at Northeastern University in Boston. She has held several administrative positions, including associate dean of ASU’s College of Public Programs and Associate Dean of ASU’s University College, and director of the ASU West School of Management MBA program. She is the recipient of several teaching awards, including the Arizona State University Parents Association Professor of the Year in 2004.